INTRODUCTION. In a case of major hepatectomy, an inadequate volume of liver remnant is necessary and pre operative assessment to be induced hypertrophy of future liver remnant is considered to be candidates for percutaneus transhepatic portal vein embolization. It is difficult to use the transhepatic route in a case with giant liver tumor or multiple tumors. AIM. 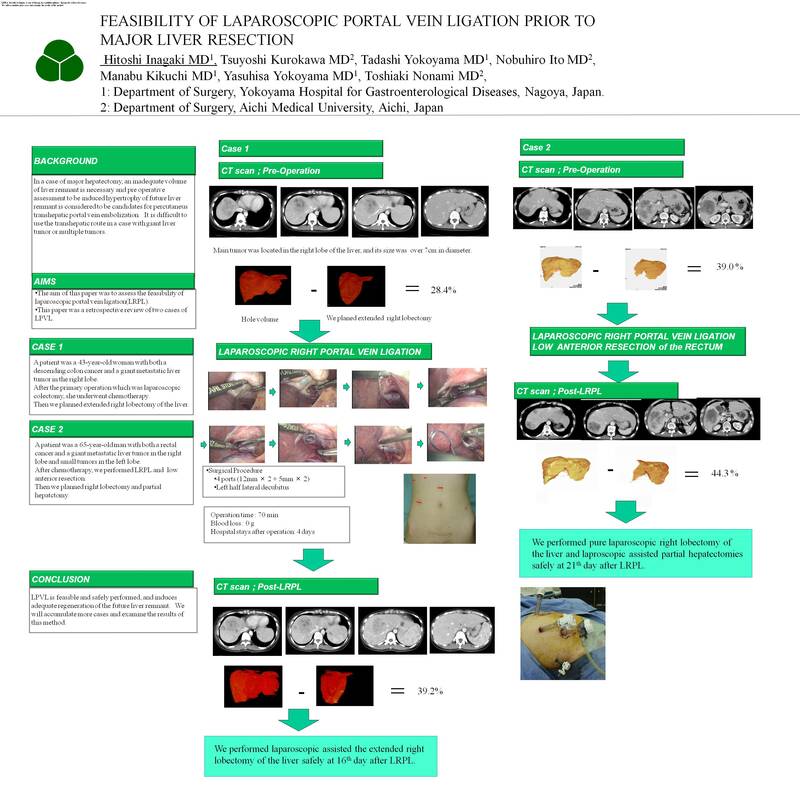 The aim of this paper was to assess the feasibility of laparoscopic portal vein ligation. METHODS AND PROCEDURES. This paper was a retrospective review of two cases of laparoscopic portal vein ligation (LPVL). We assess the feasibility of LPVL through this review of the data of these cases. RESULTS. The cases were a 43 year old woman with liver metastasis of descending colon cancer (Case1) and a 65 year old man with liver metastasis of rectal cancer (Case2). Case1 underwent only LPVL, while Case2 underwent low anterior resection after LPVL. The operating times of LPVL were 70 min and 30 min respectively. There were no intra- or postoperative complications, and all LPVL procedures were completed laparoscopically. The volumetric data showed an increase from 28% to 40% and from 39% to 45%. We performed right lobectomy by laparoscopic-assisted surgery smoothly in Case1, and right lobectomy laparoscopically with partial hepatectomy as planned. CONCLUSIONS. LPVL is feasible and safely performed, and induces adequate regeneration of the future liver remnant. We will accumulate more cases and examine the results of this method.